Much has happened in the NBA these past few weeks. With the trade deadline looming, much more is going to happen in these two short weeks. Playoff positions will be solidified, lottery teams will be looking who to draft, all while teams chase the Larry O’Brien trophy. 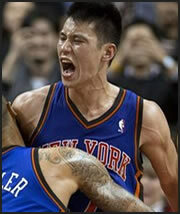 Jeremy Lin was a no name up until this season. He played for a Division II school in high school that won a state championship while averaging a 4.2 GPA. He then went on to Harvard. Interestingly enough, he wasn’t initially offered a basketball scholarship; but after a scout saw him play, Harvard offered a spot to him. After college, Lin went undrafted in the NBA but was picked up by his hometown Golden State Warriors. 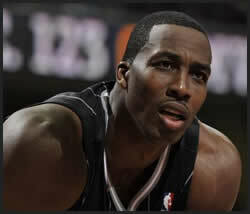 He was rarely used during the season and was assigned to the D-League a few times. The Warriors waived him the following year and he was picked up by the Knicks. Lin didn’t get his big break until a rash of injuries hit the Knicks and the coach had no choice but to play him. He became an instant sensation as he led the Knicks to a 7 game winning streak. His style of play and his work ethic became something the other Knicks players bought into. 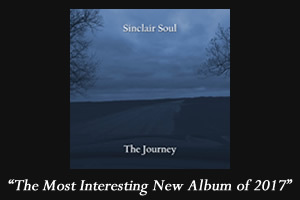 There was a noticeable increase in the energy they play with. Lin just has the ability to drive in and create shots for his team. He also can make shots for himself. The biggest knock on his game right now is turnovers. During the winning streak, he averaged a little over 5 turnovers a game. Considering that those games were his first as a starter with significant numbers, it’s understandable that he’s going to have turnovers; but to really improve his game, he’s going to have to get control over the ball. When Carmelo Anthony came back from an injury, many thought his style of play would throw off the chemistry the team gained while he was gone. For his first game back Melo looked out of place; but a few games later it looks like they are going to mix in well. Lin-Sanity is going to continue and with Melo back in the mix, the Knicks are proving to be a real contender. All-Star weekend is supposed to be a fun exciting time for NBA fans. There’s the convention, the All-Star events on Saturday night, all culminating Sunday night with the game. As for the events on Saturday night, they were ho-hum this year. The most exciting event of the night wasn’t even exciting. 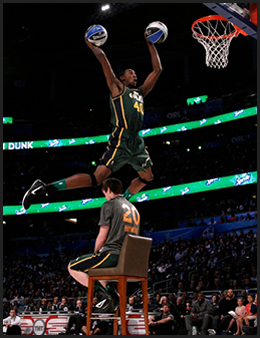 I of course, am talking about the dunk contest. The skills challenge, the 3-point shootout, and shooting stars are okay events; but everyone always looks forward to the dunk contest. The first noticeable difference for this year’s contest was the lack of major names. In the past, legendary names like Jordan, Dominique, and Carter would make the contest worth watching. Now, the reigning champ of the dunk contest doesn’t even want to compete. All these superstar players think they’re too cool for it. Another thing is that there is a lack of creativity on the players’ part. All these props and other antics are just fronts for the lack of dunking talent these players have. The legends never relied on chairs or cars or other tricks to make their dunks. They used their creativity and their presence to make the contest their own. Jordan and ‘Nique battled for supremacy. Carter created the term Vinsanity with his dunks. Today, players feel like jumping over cars or putting a sticker on the backboard is cool. Take away all these things, and their dunks are just plain boring. There’s nothing special about them that we can’t see in a game. Another factor that was missing this year were the judges. The judges are the ones who have actual insight into what was a good dunk or not. If all the voting is with the fans, who’s to say the winner is the one who actually deserved it or if it was just popularity that helped them win. The top players need to realize what a prestigious event this used to be, and enter it next year. 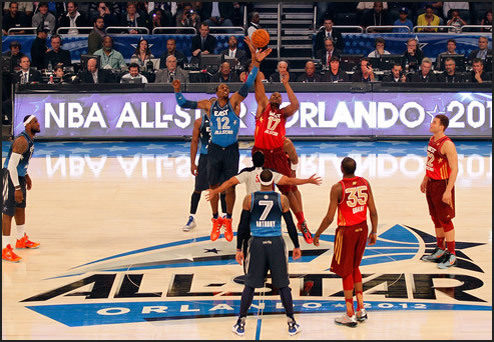 As for the All-Star game itself, it was a really impressive showing. The first half was its usual offensive showcase with very little defense. This helped the West jump out to a lead that was as high as 24. In the second half, the game got more physical as the East tried to make a comeback. There was even a hard foul on Kobe by Wade that broke Kobe’s nose and gave him a mild concussion. The West was able to hold onto the lead up until the final seconds. With the West up two with under a minute left, the East had the ball. LeBron was dribbling at the top of the key with Kobe guarding him. Kobe was urging LeBron to take the shot to “prove” himself. These are the situations that LeBron has been known to shy away from and Kobe wanted to see if it would hold true even in a game that didn’t matter. Instead LeBron passes away to Deron Williams who took the shot and missed. The East got the rebound and the ball ended up in LeBron’s hands again. Same situation, Kobe guarding LeBron at the top of the key, yelling at him to take the shot. I, for one, thought LeBron would take the shot just so he could shut Kobe up. Instead, he chooses to opt out again and passed it. This time, the West stole the pass and would run out the clock to win the game. Even if this was a game that didn’t matter, LeBron will still be mocked for folding under pressure again. All during the weekend, the commissioner, the mayor of Sacramento, and the owners of the Kings were meeting to see if they could agree on a deal that would keep the Kings in Sacramento. The Kings were on the verge of moving to Anaheim at the end of last season, but the city made a push to convince the league for the team to stay another season. All the Kings and city of Sacramento had to do was come up with a plan to finance and build a new arena. Over this past weekend, they agreed on a deal for the new arena to come true. The Kings and their fan base are very connected. In that Sacramento region, there’s little to nothing that’s really going on for them right now. However, the mayor has really been trying to revive the area ever since taking office. The main thing they’ve been pushing is remodeling their downtown area to attract more visitors. If the Kings left, it would devastate the area because it was such a good business for them. 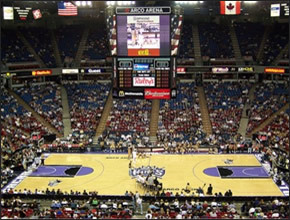 At one point, the Kings had the record for most consecutive sold out games. This city needs the Kings as much as the Kings need this city. The fans provide such a big source of revenue for the team, that it would just not make sense for the Kings to leave. Much can still happen in the coming weeks for the NBA. There are the ever revolving trade rumors that could or could not happen in the next few weeks. Several marquee players could be on the move if their teams decide to pull the trigger. In Dwight Howard’s case, the Orlando Magic want to trade players to convince Dwight to resign as a free agent this summer. In the case of Rajon Rondo, Boston can let him go to a team that has legitimate title chances and start their rebuilding process. Their team is already so gutted from the last time that they were in the championship. Their Big Three are all over the age of 34. The Celtics must realize that and will have to go to into rebuild mode soon. The other significant team hoping to make a trade is the Los Angeles Lakers. Their real need is the point guard position, yet the player often mentioned in trades is Pau Gasol; the power forward. If they trade him, they will be trading away one of the most talented big men in the league right now. Their bench depth and point guard position is where they really need to improve on. If Gasol is traded, no player will be able to fill his position; the only way that would happen is if they traded for another big man with his skill set. And those are far and few between in this league. Only time will tell what happens before the deadline and how the season closes out. Let’s hope that something does happen, and all this hype isn’t for nothing.